This is a very good replica of the famous Wipac "Ducon" handlebar switch which functions as a dip and horn switch. They were fitted as original equipment by some British bike manufacturers (Triumph, BSA etc.) or supplied as an aftermarket accessory. This is an excellent switch to use on a cafe racer or special (or any machine) where you need a slim, neat switch where the operation "falls readily to hand", handy with clip-ons. They don't foul the handlebar levers like some of the big clunky switches that are available. We also have the "Tricon" switch which has dip, horn and stop functions, please see our other listings. 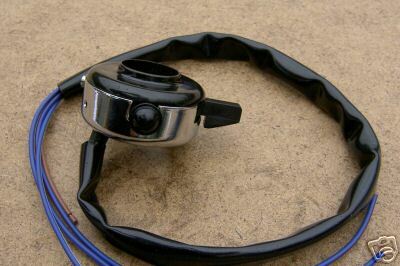 If you are fitting this to a custom bike with very high or wide bars please note it is easy to remove the wiring and fit a longer loom as the switch has screw type terminals.